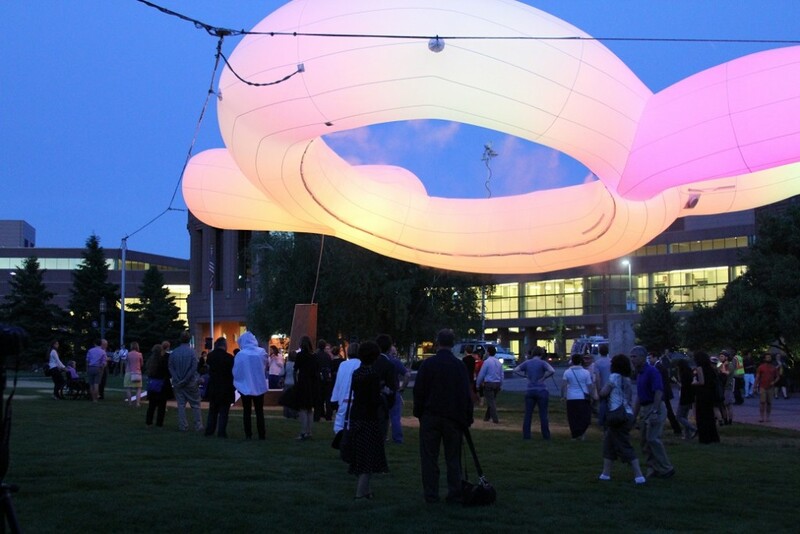 Minneapolis Interactive Macro Mood Installation, or MIMMI, is an emotional gateway to Minneapolis, bringing residents and visitors together to experience – and participate in – the collective mood of the city. MIMMI seeks to engage both the virtual and physical layers of the community, using technology to see the city in a new way and also reinforce the serendipitous gathering that has characterized urban life for millennia. MIMMI is a large, air pressurized sculpture suspended from a slender structure located at the Minneapolis Convention Center Plaza. Cloud-like in concept, the sculpture hovers 30 feet above the ground, gathering emotive information online from Minneapolis residents and visitors to the plaza. MIMMI analyzes this information in real-time, creating abstracted light displays and triggering misting in response to this input, creating light shows at nighttime and cooling microclimates during the daytime. Whether the city is elated following a Minnesota Twins win or frustrated from the afternoon commute, MIMMI responds, changing behavior throughout the day and night. MIMMI’s design team sees it as a productive response to how cities and societies have evolved in relation to ubiquitous digital media, taking advantage of the new abilities and insight such technology provides, while working to balance those privileges with new responsibilities as cities change. With more of the planet becoming urban, as well as modified by human activity, the state of the city and our use of resources must respond. MIMMI is designed to merge the discussions of digital technology, resource use and a densifying urban environment, creating an enjoyable place to gather and see the city in a new way while exploring shifting cultures and responsibilities. The Creative City Challenge (CCC) is a competition for Minnesota-resident architects, landscape architects, urban designers, planners, engineers, scientists, artists, students and individuals of all backgrounds to create and install at the MCC Plaza a temporary, destination artwork. The artwork acts as a sociable and participatory platform for summer-long onsite programming, and encourages a sense of connectedness to the city as a whole and its rich cultural and natural offerings. The MCC Plaza is a green roof that is located directly across from the MCC at 1301 Second Avenue South. The CCCs goal is to draw visitors and residents of the city to the Minneapolis Convention Center as a central meeting space for the surrounding area, as well as to provide a compelling gathering site for the MCCs thousands of visitors. The commission fee for the winning project is $75,000, inclusive of all artist fees, installation and de-installation costs. The winning project will remain on the MCC Plaza throughout the summer and be the site of public events to be announced at a later date. The MCC is a site of convergence for visitors to Minneapolis from around the country and the world, as well as being a part of the local neighborhood, and Minneapolis downtown. The Minneapolis Convention Center (MCC), the Arts, Culture and the Creative Economy Program of the City of Minneapolis and Meet Minneapolis, Convention & Visitors Association, in collaboration with Northern Lights.mn and the Northern Spark festival are responsible for the annual Creative City Challenge competition and associated programming. More information about Creative City Challenge, past projects and the new winning project is available on the Minneapolis Convention Center website.